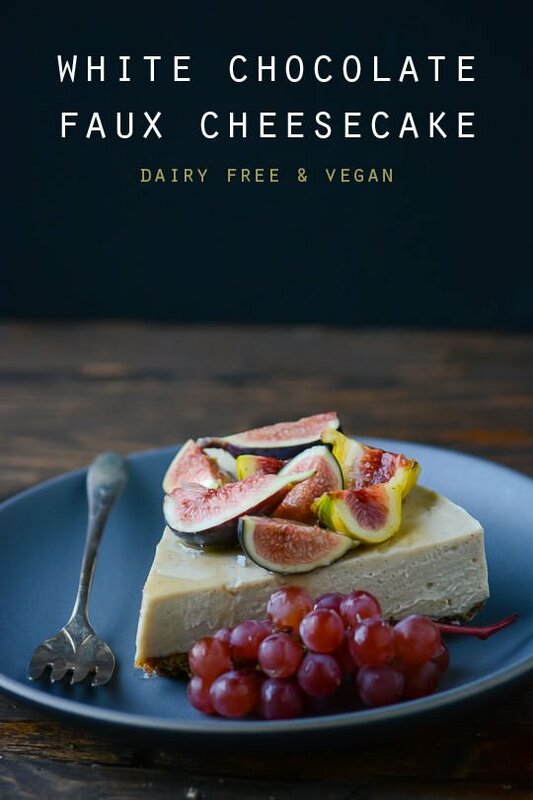 I love the challenge of developing vegan desserts. Part of me thinks that if I can make a delicious dessert without the use of butter or cream than I have really accomplished something. The one requirement I have when experimenting is that all my ingredients need to be as natural as possible. There are some great non-dairy butter and cream options on the market but they tend to be full of stabilizers and preservatives. I took my inspiration from A House in the Hills, it’s one of my favorite reads so if you haven’t checked it out you should really give it a look. The biggest change I made was to the base of the cheesecake. 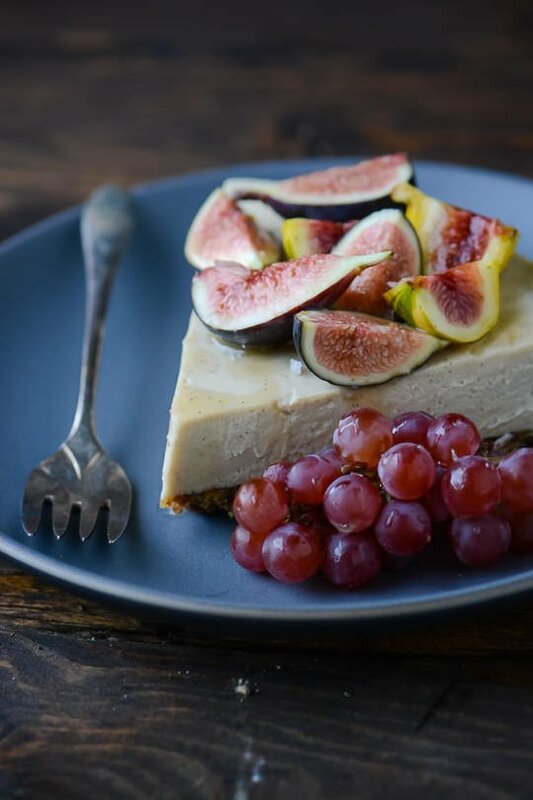 Vegan cheesecakes usually have to be frozen to keep their shape but this one has the exact texture of a baked cheesecake thanks to the addition of some raw cacao butter. This turned out better than I could have ever hoped. It has an incredibly smooth texture and the subtle taste of the chocolate makes it so rich and luscious that I never missed the dairy. There are a lot of different kinds of cocoa butter on the market and you want to make sure that you use one that is appropriate for consumption. 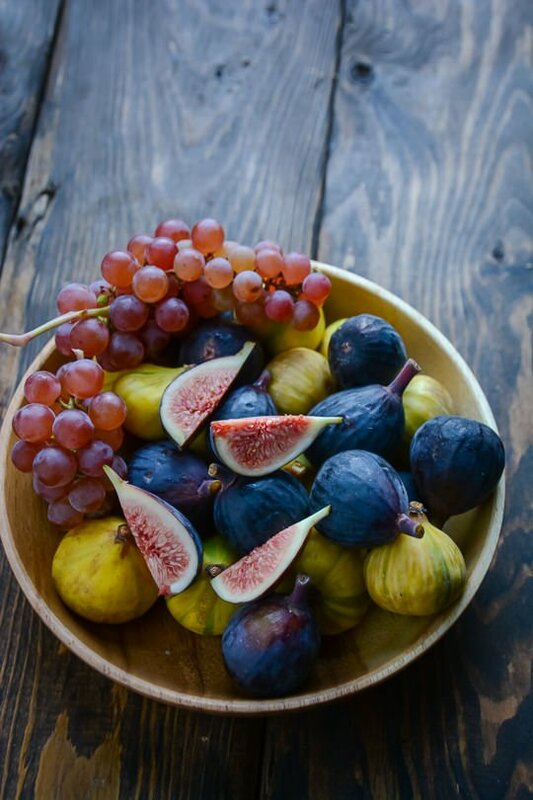 If you can’t find fresh figs some stone fruits would be a good substitute and don’t forget the salt, it’s absolutely critical! So whether you are following a strict vegan diet or not you should really give this one a try, you won’t regret it! Soak the cashews for the cheesecake in enough water to cover for at least 1 hour or up to overnight. For the crust, combine all the ingredients in the bowl of a food processor and pulse until crumbs form and the mixture holds together when you pinch it between your fingers. Spray a 9" springform pan with cooking spray and then press the crumbs into the bottom of the pan smoothing the top with the back of a spoon to make an even layer. Fill a small saucepan with an inch of water and place a heatproof glass bowl on top. Split the vanilla bean in half and add to the bowl along with the cacao butter and stir occasionally until the mixture is melted and smooth. Remove from the heat and let cool slightly while you prepare the rest of the ingredients. Drain the cashews and rinse well. In a Vitamix or other high-speed blender, combine the cashews, lemon juice, maple syrup, almond milk, and salt. Blend until the mixture is smooth and then add the cacao butter and the whole vanilla bean to the blender. Process for another 30 seconds or so or until the mixture is totally smooth. If your mixture is too thick feel free to add a little bit more almond milk if necessary. Pour the chocolate cashew mixture over the prepared crust and use a spatula to smooth the top. Cover the pan with plastic wrap and place in the refrigerator for 2 hours. To serve, release the cake from the springform pan. Combine the honey with the hot water and vanilla and stir until the mixture is smooth and pourable. 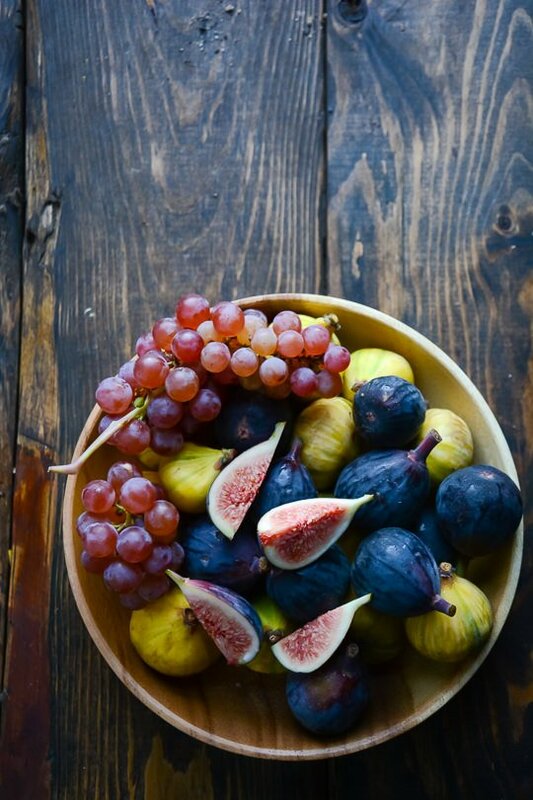 Clean the figs and cut into quarters. 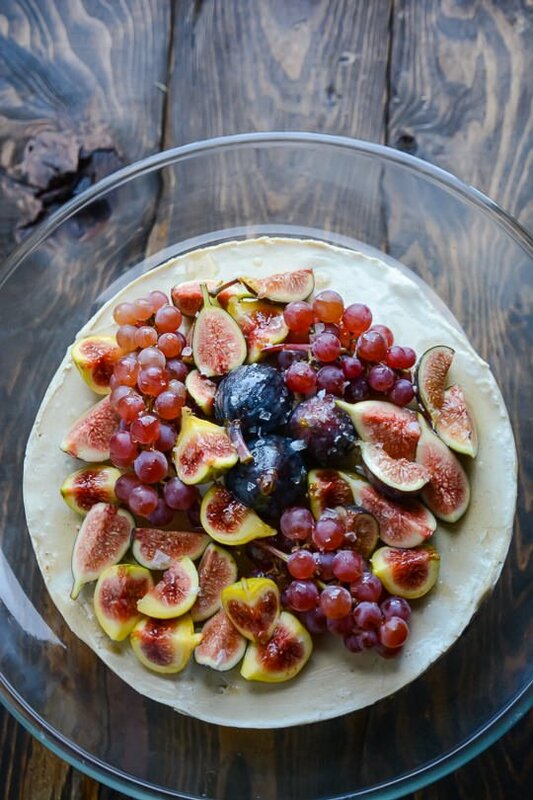 Toss the figs and the grapes in the honey mixture and arrange to your liking on the top of the cake. Sprinkle generously with the Maldon salt (a teaspoon or so) and serve a little extra on the side if desired! 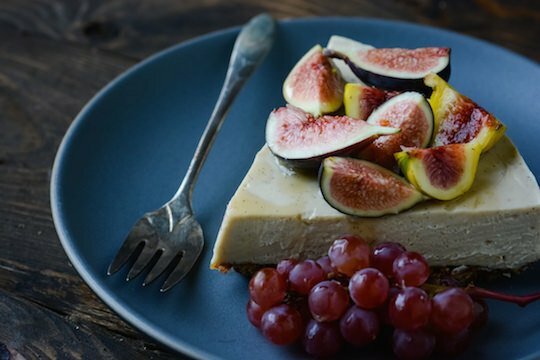 There is something about raw cheesecakes that are so rewarding. 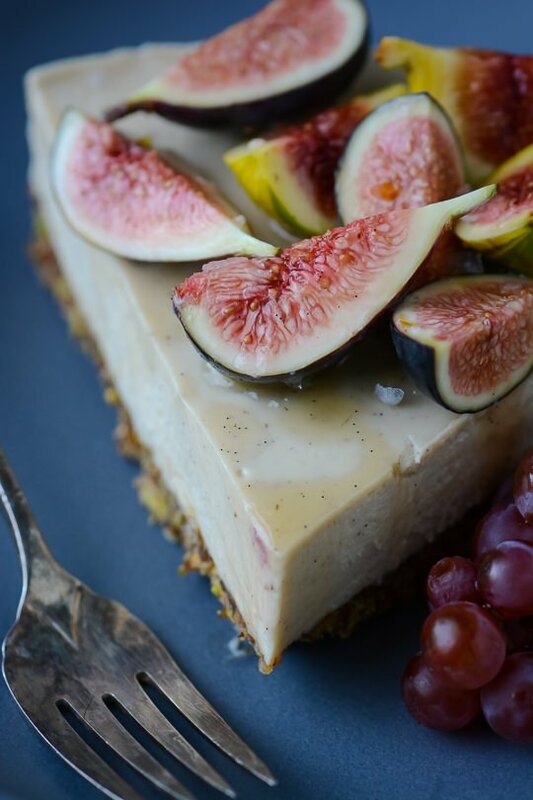 This looks lovely with the lemon in the filling and the cinnamon in the crust, and it’s the perfect dessert for topping with figs. Yum! Im curious about being a vegan, I thought we werent allowed honey ? You are correct, if you are following a strict vegan diet, honey is not allowed. I eat a lot of vegan meals but am not exclusively vegan. 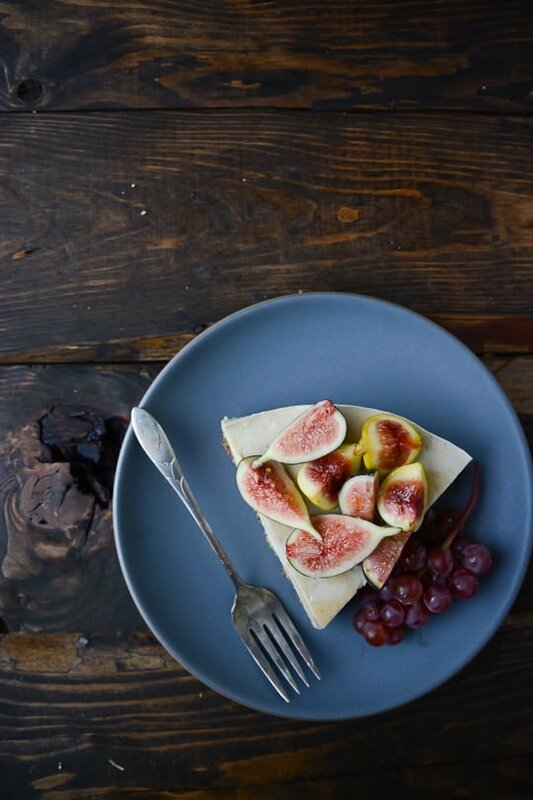 You can substitute 2 tablespoons of maple syrup for the honey and omit the hot water for glazing the figs, it will still be delicious! I hope you like the recipe if you give it a try!